The new OAYP advanced metric ranks the SEC's returning quarterbacks. I’ll preface this by stating that the marginal OAYP scores for the SEC quarterbacks are skewed by having two of probably the five best quarterbacks in the entire country at the top. As a result, the other qualifying signal callers’ marginal scores are almost entirely negative. I can all but guarantee that when we look at their marginal ratings against all qualifying returnees at QB that the numbers will go up across the board. In the meantime, though, there is still value in evaluating quarterbacks against their SEC counterparts, only within the context of the league, given that it is those players against whom they will primarily be competing. You won’t be surprised at the top, but after that, it gets interesting. We’ll tier them out into ‘superstars’ (marginal OAYP >1), ‘average to above average’ (in the 50th percentile or better), ‘not as good as we thought?’, and potential breakout stars (players that didn’t get enough reps to qualify, but posted high OAYP scores on a smaller sample size). Sorry Trevor Lawrence, but until proven otherwise over the course of a full season, Tua Tagovailoa is the best returning quarterback in the country, fresh off of one of the most impressive individual campaigns ever, regardless of how it ended. Since the turn of the century, 20 other quarterbacks had as many passing yards and touchdowns as Tagovailoa, but none did it in as few attempts, and only two with as many or fewer interceptions. He posted the highest passer rating of all time, and even though he had a relatively hard time against Georgia and Clemson down the stretch, those were two of the five best pass defenses in the sport, at worst. Jake Fromm is the second best quarterback in the conference, and that distinction doesn’t even begin to do him justice. He’s arguably a top three quarterback in the entire nation, just behind Tagovailoa and Lawrence. He’s fresh off of a second consecutive top ten finish in passer rating and only twelve other quarterbacks this century have thrown at least 24 passing touchdowns and seven or fewer picks in back-to-back seasons, as Fromm now has. That shortlist includes the likes of Heisman winners Tim Tebow, Marcus Mariota, and Baker Mayfield. Assuming he does it again, which feels like betting on the sun to rise, he will join Geno Smith as the only other one to do it thrice in a row. For Starkel I used his 2017 production at Texas A&M. He missed half of that season due to injury, but we got a decent sample size that included 67 attempts against Mississippi State, Auburn, and LSU. Unfortunately, he largely struggled in those contests, completing just over 52% of his passes with a 5:4 touchdown to interception ratio, albeit at a solid 8.12 yards per attempt. His season numbers were bolstered by huge performances against New Mexico and in the bowl game versus Wake Forest, but his OAYP score still might be a bit misleading. Factor in his transfer to a new offense under Chad Morris, and it’s probably not fair to expect the same production this season. That said, using Ben Hicks’ numbers from SMU, his fiercest competitor for the job is ranked second to last in OAYP among qualifying quarterbacks with a -0.97 rating, so maybe it should be his job after all. I’m still skeptical about Feleipe Franks in a vacuum, but he doesn’t play in a vacuum, he plays in a Dan Mullen offense. Mullen proved that his reputation as a quarterback whisperer was earned with the work he did with Franks in 2018. As B.J. Bennett recently explored, Franks is on a historic trajectory, and there’s no reason to expect his ascent to slow down. Jake Bentley’s spot here is not all that unexpected. He was top four in the league in yards per attempt and touchdowns a season ago. The problem is that he can be two totally different quarterbacks from one week to the next. 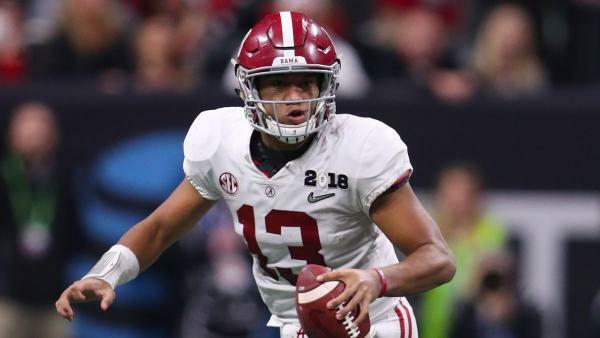 Against Coastal Carolina, Ole Miss, and Clemson last year, he might as well have been Tua Tagovailoa. Er, actually he was better than Tua against Alabama. But then he can also go out and throw more passes to opponents than touchdowns or post sub-111 passer ratings, like he did against Georgia, Kentucky, and Virginia. Apparently at the end of the day that all averages out to slightly above the mean, but that is hardly ever who actually shows up on Saturday. More often than not, it’s one or the other. Joe Burrow, huh? Alrighty then. This one made curious, so I factored out his overtime production against Texas A&M and it knocked his score down a bit, .04 points to be exact, but not enough to move his ranking. Technically because of Tagovailoa and Fromm he wasn’t average, per se, but he was the median SEC qualifier. I don’t know. He was eighth in the league in yards per attempt, completed less than 60% of those throws, and ranked 12th in passer rating. He did run the ball well and have a respectable touchdown to turnover ratio, but if he ends up in the positive after the national adjustments, which he probably will, I’ll be perplexed. Then again, I’m already moderately perplexed, so that won’t be much of a change. This is tough for me. I love Kellen Mond. I was stunned when he earned the starting job over Nick Starkel, but clearly Jimbo Fisher knew a little better than I did. Not only did Mond display marked improvement, pretty much across the board, but he was also one of the most exciting improvisers in the country from the quarterback position. On throws from outside the pocket, Mond’s 4:0 touchdown to interception ratio was tied for the best in the FBS. I do anticipate further progression from Mond in 2019, but the schedule is a nightmare. I’m not sure the numbers do him justice, but the formula is what the formula is. Whatever, I still like him. Similar to Starkel, I used Bryant’s 2017 production from Clemson. This was jarring. He took that Clemson team to an ACC Championship and the College Football Playoff. Then again, looking at his OAYP score, maybe that Clemson team took him to an ACC Championship and the College Football Playoff. However, like Bentley last year, there were two totally different versions of Kelly Bryant, in 2017. Over the first ten games of the season, Bryant completed 36% of his passes that travelled at least 15 yards downfield for an average of 10.5 yards per attempt, with a 78.3 QBR. In his last three games, prior to the playoff, he completed 64% of such passes for 18.1 yards per attempt, with a 100.0 QBR, including a 5/5 showing with a touchdown against Miami’s widely heralded secondary, in the ACC Championship. He posted another dud against Alabama in the postseason, but the flashes he showed in the lead up to that contest are undeniable. There won’t be any postseason for Bryant or his new team this year, but he will nonetheless be one of the most fascinating players to watch in the SEC. Take Thompson’s score with a grain of salt. That 4.3 marginal OAYP -- which is higher than Tagovailoa’s -- was from mop up duty for Nick Fitzgerald last year. If we use his 2017 numbers, which actually give him enough snaps to qualify, he’s at -0.81, which is only higher than Hicks’ SMU score and Bryant’s 2017 Clemson score. The only time he registered more than eight combined rushes and pass attempts in 2018 was in the opener against Stephen F. Austin, an FCS program. If we combine the totality of his production from both years, his marginal OAYP is 0.77, which is third in the SEC. That’s still probably a little hot, bolstered by that SFA game, but I don’t hate it. Thompson is promising, but not 4.3 marginal OAYP promising. Yep, Corral’s 2.0 marginal OAYP is higher than Jake Fromm’s. Corral also threw just 22 passes in 2018 while backing up Jordan Ta’amu. Corral is talented and Ole Miss’ offense was conducive to effective quarterback play. The former’s 2018 OAYP score would have put him third in the SEC coming into this season, had he been eligible for another season. We’re going to get a different look from the Rebels, though. With Rich Rodriguez coming in to take over the offense, who knows what to expect behind center. That hire probably bodes well for Scottie Phillips, but you’ll have to forgive me if I’m not ready to assume that Corral will be as dynamic as Khalil Tate or Pat White were under Rodriguez. The Ventura, California-product is talented, no doubt, but only time will tell how well Rodriguez can adjust to his QB’s skillset.